Signal Hill Elementary School students and volunteers recently built seven raised planters, filling them with soil and seedlings, as part of an American Heart Association effort to encourage healthful eating habits at schools nationwide. Garden-themed lessons teach nutrition, math, science and other subjects. The children will harvest produce in the Teaching Garden as part of their lessons on healthful eating. 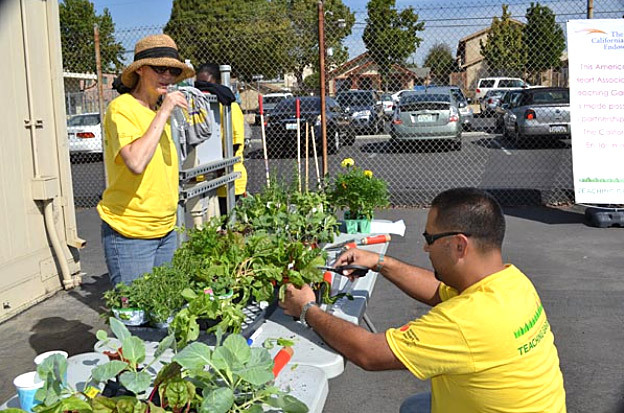 Learn more about the Heart Association's teaching gardens. PLANT DAY – Signal Hill Elementary School fourth grader Chenna Parady participates in a recent "plant day" for the school's American Heart Association Teaching Garden.